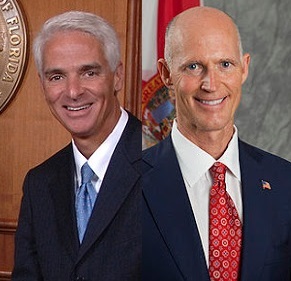 DAVIE, Florida -- The second debate in Florida's 2014 gubernatorial race between Florida Governor Rick Scott and former Florida Governor Charlie Crist will take place tonight from 7 p.m. to 8 p.m. Eastern Daylight Times at Broward Community College in Davie, Florida. Libertarian candidate Adrian Wyllie, who is polling in double digits, lost his federal court battle to legally force his way into tonight's debate. Wyllie is holding his own debate on YouTube tonight. Tonight's debate will air on ABC affiliate WFTV Channel 9 in the Central Florida area and the Sun-Sentinel newspaper will stream the debate live online. WFIT 89.5 FM in Melbourne and WMFE 90.7 in Orlando will air the debate on the radio along with other public radio stations across the Sunshine State.